Last weekend, Oldest Son’s California-born girl friend stayed with us. She volunteered to make us some authentic Mexican salsa. She came home from the store with mangoes, avocados, a hot pepper and a huge bunch of cilantro (mine has started going to seed). I didn’t even know what a mango looked like, and I had no idea what to do with an avocado. I usually omit the hot peppers because they scare me. However, she whipped up the tastiest batch of chunky salsa I ever ate in my life. I used it with chips, I made a salad with it, and I served it with my leftover chicken. I ate far too much of it, but it made me feel good. Certain foods affect my moods. Back at college, there was a place called Brook’s Other Place. Brook was a hippie-type Sociology professor at the school. His first restaurant, Brook’s Place, served typical college food like hoagies. His other place specialized in more obscure vegetarian and health foods. When we went to Brook’s Other Place, I would always get a sprout salad (with alfalfa sprouts) and a large tomato juice. For some reason, this meal not only tasted great, it always managed to lift my mood. It had the most calming effect on me, even if a paper was due the next day. It was great mood food. Yesterday was a gray day, quite unlike the beautiful late summer day exactly eight years ago. Each September 11th, I distinctly remember how beautiful and blue the sky was that morning in 2001 as I walked into work. It’s weird, but I remember thinking that morning that even though it was early and I had to work that day, I felt so happy to be alive. It was just that gorgeous of a day, which made the tragedy that unfolded a couple hours later so much more hideous. Even though I didn’t personally know anyone that died that day, I always feel somber and sad for the innocent moms and dads, brothers and sisters and heroic rescue workers that lost their lives. It could have been me or anyone else I know and love in those buildings or on those planes that day. Feeling blue already, my breath was taken away when I read someone’s Facebook status yesterday. I knew her politics were liberal, but I thought she loved this country that has provided her with so many opportunities. In fact, she claims to be a liberal because she cares so much about people. I’m sure this wasn’t her intention, but I had the wind knocked out of me when I saw her comments concerning 9-11, to f**k 9-11 and that she didn’t even care. When no one could even respond to this, she went on to explain how these 3000 lives were no more important than all the other lives we? they? are responsible for bombing. I’ve heard this “justification” for 9-11 before. I’m sure that every one of those almost 3000 people were secretly cheering on and plotting new ways to kill other people in far away countries. Yeah, right. I know there is no way to change the thinking of these kind of people, but it still saddens me that someone can actually think this way. I couldn’t talk to anyone about this yesterday. I couldn’t even let it out until now. I just felt sad and blue and sick to my stomach. And I went out to the store and bought a mango. And some avocados. I still feel in a funk today. The chunky salsa I made last night tastes good, but I sure could use a sprout salad and a tall glass of tomato juice. Zucchini Burnout–Here Are Some Recipes!! I’m trying to use up the rest of our zucchini from the garden. It grows and produces like a weed for us, which is why I quit growing it for a few years when the kids absolutely did not like it. But now they actually will eat it. They don’t crave it or anything, but cooked like we do in the following recipes, they actually like it–and Big Daddy and I looove it. We decided to grow two separate mounds this year, each planted about 2 weeks apart, so that we didn’t get the whole harvest at one time. And always pick them when they’re small–like cuke size. Torpedo zucchinis are tough and lousy. Here’s the recipe I’m making tonight. It tastes like pizza–and it’s simple to make. Mix all ingredients together in a large bowl (except for the mozzarella). Bake in a 9×13 pan at 350 degrees for 35 mins. Halfway through baking time, sprinkle mozzarella cheese on top. (I use extra cheese). Serves 6. Our favorite is grilled zucchini. We cut two zucchini lengthwise down the middle, and put cut side down into the following marinade for about 2 to 3 hrs. Cook on your grill (on high I believe on our gas grill) for about as long as it takes to grill chicken breasts (about 20 mins.) basting occasionally with marinade. Then slice the cooked zucchini halves crosswise into serving pieces. It’s sooo good! Yesterday, of course, was the sad day we had to take Middle Son J to the airport to begin his year-long deployment to Germany. The night before, we had my family over for pizza because they all wanted to say goodbye to J. Well, we no sooner got the place back to normal after the pizza party when my sister-in-law calls and tells us she wants to have a luau the next night. She had wanted to have one the weekend of our anniversary, but since we were in Pittsburgh, she decided to have it another time. And next Saturday, we’re moving Youngest Son back into his dorm. My sister-in-law is kind of a social butterfly; she loves to entertain and to go out. Big Daddy and I are content to go out maybe once a month and having two gatherings in a weekend was a bit more than either of us would have preferred, but we agreed to go. 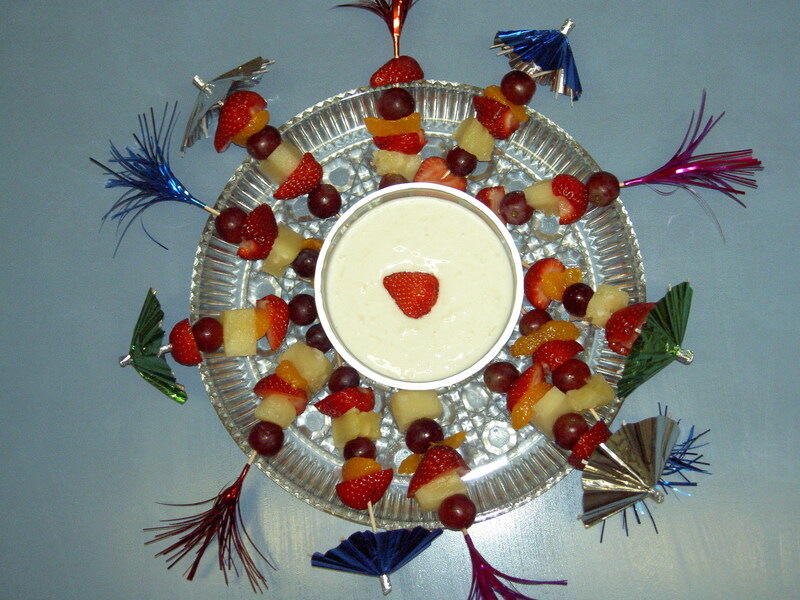 She asked me to bring an appetizer, so that night I went online to find some luau recipes. I couldn’t really find an overabundance of luau appetizers, but I found this crock pot recipe for luau meatballs that I thought sounded good. I planned to stop at the store after we got home from the airport and then get those meatballs cooking. We didn’t have to be at the airport until about 11:30 Saturday morning. I had a quick breakfast of coffee and a Slim-Fast bar, we packed up the van, and headed out. On the way there, I started feeling queasy. I’ve suffered from motion sickness since I was a baby, but it was hitting me really bad yesterday. I tried to recline my seat a little and not think about it, but I felt miserable. The traffic was horrible, thanks to PennDOT and their little road projects, so before we got to the airport we decided to stop at a hotel and relieve our bladders. As soon as I stepped out of the van, before I could even get to the curb, I tossed my cookies all over the parking lot. Big Daddy and J just stood politely by waiting for me to decide whether I was done throwing up, because I felt like I could go more. J gallantly hands me a napkin he’d been holding so I could wipe my mouth, and we went into the hotel to pee. We hung around at the airport for a little while until J said he was ready to go to the gate. We could have gone to the gate with him since it was a military departure, but stupid me didn’t think about it before I left and so I didn’t have any ID on me. On the way home, that carsick feeling was back. Big Daddy glanced over, looking a little concerned, when I reached into the back for some plastic shopping bags. I heaved and puked into that Aldi’s bag the whole way through the Squirrel Hill tunnel. I don’t know what the deal was. I haven’t actually puked from motion sickness since I was a kid. I’ve come close, but nothing like this. The last thing I wanted to do when we finally got home was think about food. I just laid down on the family room floor, feeling like I wanted to die. I didn’t get up until I felt that I could, which turned out to be about 3:30pm. It was too late to make the meatballs. I had to start from scratch and find a new recipe that I could whip up in a flash. I found this one, and dashed off to the store to get the ingredients. I even stopped at the Dollar Store to find some plastic skewers, but instead found these cute little wooden ones with colorful decorative tops. Considering the luau started at 7:00, I’m pretty proud of myself that I was able to shop, prepare this dish, and make myself presentable in such a short time. I made Big Daddy take a picture of my little luau dish while I was getting dressed. Kinda cute, isn’t it? Yum. I actually got up 10 minutes earlier the other day so I could take advantage of the McDonald’s breakfast promotion. Big Daddy and I were watching TV Wednesday night and saw an ad that said if you purchased a medium or large beverage, you could get a free Sausage Skillet Burrito. Well, being on the road all day, Big Daddy often stops for coffee so this would just be a bonus for him. For me, I get all the free coffee I want and I don’t like to wake up any earlier than the very last second I can manage to throw on some clothes and makeup and make it to the office by a very soft 8ish. But I was getting tired of eating my Slimfast bar with my coffee every single morning at my desk. I felt like mixing it up a little bit. I was also getting tired of waiting every morning until the coffee was ready because my soft 8:00 was still closer to the real 8:00 than most of the others. Haha! I was going to get my own free burrito and large hot coffee, plunk down at my desk and let someone else make the damn coffee ’cause I had my caffeine fix for the day. I have to tell you, I enjoyed every bite of that burrito. It was a meal-sized burrito, unlike the former smaller breakfast burritos. The potatoes, which I thought would be the part of the burrito I wouldn’t like, somehow tasted like chicken. In fact, I at first thought there was both chicken and sausage in the burrito. It was loaded with scrambled egg and cheese, and yummy grilled red and green peppers. To me, the seasoning was just right. Big Daddy, however, said he would stick to his fave, the Sausage Biscuit. He thought the burrito was a little too spicy for his taste. But for me, who prefers leftover Chinese food or pizza for breakfast instead of wasting calories on wussy cereal or other bland “breakfast foods,” it was just right. Just don’t tell me how many calories are in them!